Are you looking for an attractive mountain bike with high-end gears and brakes? 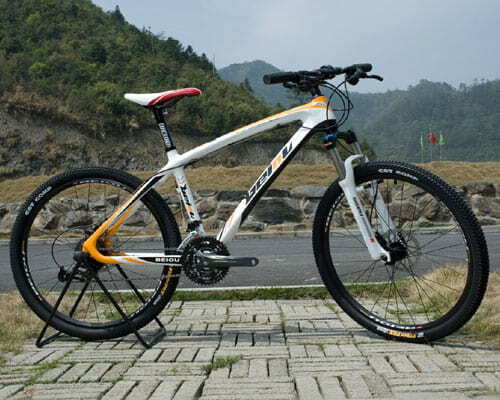 If so, then you should consider BEIOU Carbon Fiber 650B Mountain Bike from BEIOU. This bike is rich in amazing features and is affordable, but these are not the only factors that make it the best buy, but also it is designed and produced by BEIOU a well-known and trusted biking company. BEIOU repute is associated with the production of high-end mountain bikes with superior features and components and functionalities. Carbon Fiber 650B Mountain Bike comes with more than a few top-notch features, among them is its super light carbon fiber frame that makes this mountain bike very light as well as making it strong and more durable. Therefore, if you are a professional athlete or cycling enthusiast, then this top mountain bike is the best buy for you, because of its sturdy and durable design linked to the carbon frame. 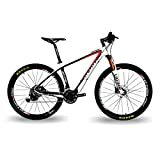 The brake system of this mountain bike is among the essential factors that every mountain biking enthusiast will consider when buying the best mountain bike; Carbon Fiber 650B mountain bike comes with a comfortable seat and powerful brake system that uses Shimano M355 technology hydraulic brakes. These brakes offer powerful and instant braking in all conditions; so, when riding this bike, you won’t worry about hitting obstacles or injuring others due to brake failure. If you have been looking for a mountain bike with a speed system that gives you more speed with less pedalling and easy gear controls across the mountain, then Carbon Fiber 650B is all that you need. It has 3*10 Speed that uses high-end SHIMANO DEORE 610-speed-control system that offers you excellent gear control and racing in all conditions and is very durable giving you a ride that is worth your investment. Carbon Fiber 650B mountain bike comes with a wheel of size 27.5″ that give you smooth riding in all terrains and with made of carbon making them light and unyielding. Also, its seat post is made of carbon fiber and has a very comfortable saddle that can absorb every shock while riding giving you a smooth ride. This mountain bike is the best buy especially if you are a looking for a bike that suits harsh hilly condition since it comes with UDING DH32 air suspension fork that is highly responsive to hitches and bumps along the road. Also, its cable routing is internal, so you will not interfere with its cabling easily; the whole bike weighs 10.7kg, which is very light making it best for bike racers. While pedalling on a smooth trail or climbing a hill you always want to stay on the saddle, but when riding on a technical train, mainly descending, it is recommended that you stand on your pedals with your knees, elbows and waist bend a little. This will help in absorbing the shocks caused by pumps on the track as well as create a frame that will prevent you from being pushed around in the process. When you are riding on this outstanding BEIOU Carbon Fiber 650B mountain bike, you should focus on where you are going to avoid bumping into logs, rocks or trees on the trail; failure to look at such obstacles may cause injuries to you. Therefore, when riding you should look approximately ten meters ahead of you and follow the line you have chosen to avoid hitting obstacles. Use both brakes especially while riding down the hill this will help you control the speed and stability of your bike. Also, applying both brakes it will give you effective and efficient stop when needed, preventing you from hitting walls that may result in serious injuries? When you are planning to go for mountain biking, it is important that you put on the right and comfortable cycling gear, this will enable you to experience the comfortable and safe mountain biking. Also, you can as well consider wearing knee pads for better safety and more comfort while on the ride. Riding a bike involves up and downs especially when you are riding on a hilly place that is why it is important that when shifting gears you should do it as it supposed to be, this will enable you to climb uphill with a lot of ease. It also prevents wear and tear of your bike’s chain, rear cogs and front cassette, which is it is important to shift your gears properly. Carbon Fiber 650B Mountain Bike is, without a doubt, the best bike that you can tackle some of the most mountainous paths and challenging tracks. Therefore, if you are looking for a high-end mountain bike that is highly functional and will offer you excellent riding experience that is worth its cost, look no further than this mountain bike.